In 1988, the FOX network in the US debuted a TV show called America's Most Wanted. It was a sensationalized and, to be honest, somewhat trashy dramatization of the crimes of some of the country's most violent fugitives, accompanied with their detailed descriptions and last known whereabouts. In between dimly-lit scenes recreating brutal murders and abductions, viewers were encouraged to call the show's hotline if they had any information. The call to action may have been a paper-thin veneer to justify the show's production... but it worked. In under a week one of the FBI's ten most wanted was arrested based on a viewer tip. America's Most Wanted isn't around anymore, but the Federal Bureau of Investigation hasn't forgotten the value of the public's attention. 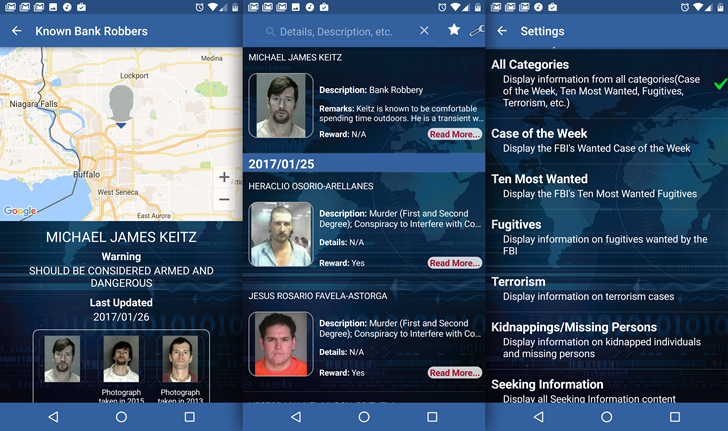 To that end they've published FBI Wanted, an official Android app that displays the descriptions, crimes, last known locations, and other vital information on the country's most dangerous federal fugitives (and victims of suspected kidnapping and murder, too). 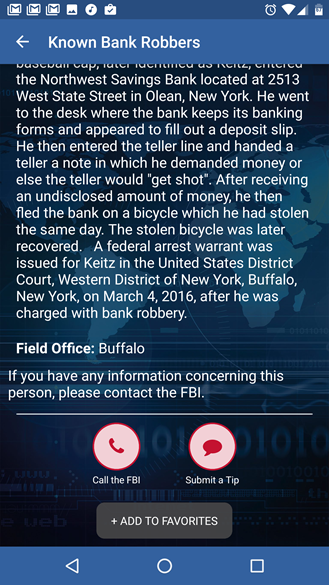 There's even a button in the app to place a direct call to your local FBI office if you have information that could help lead to an arrest. And yes, for some of the fugitives there's a reward for that information. Users can search by location, crime, or status to find more relevant results, or save individual listings for quick retrieval later. Who you gonna call? Your local FBI field office. Hmm, nope, doesn't scan. The app is functional, if not exactly stellar - no one ever accused the feds of being particularly concerned with aesthetics, and the app's search and filter function is rather slow. Still, it's free, and it's the next best thing to having John Walsh on speed dial. And this should really go without saying (but I'll say it anyway): the Wanted app is supplied for information purposes only. The FBI isn't giving ordinary citizens the implicit authority to investigate federal crimes or arrest suspected criminals. You are not Batman - call the cops or the feds if you see someone on the list.